Beyonce Drops Out of ‘A Star is Born’; Esperanza Spalding In? *Clint Eastwood and Beyoncé won’t be making beautiful movies together anytime soon. The singer has confirmed that she will no longer star in the director’s remake of the classic film, “A Star Is Born,” reports MTV.com. Beyoncé was first attached to the part in January 2011, but production was eventually pushed back when she got pregnant later that year. While she won’t be in the movie, she has been keeping busy. She recently appeared on stage alongside her hubby Jay-Z when he closed out his shows at the Barclays Center in Brooklyn and she’s rumored to be working on new tunes. Variety first reported the movie news, with sources saying that with Beyoncé out, Grammy-winning jazz musician Esperanza Spalding is now being considered for the role. Spaulding made headlines in 2011 when she took home the award for Best New Artist at the Grammy Awards, beating out Justin Bieber. However, no decision for that role will be made until a male lead has signed on. Bradley Cooper, Leonardo DiCaprio, Tom Cruise, Christian Bale, Johnny Depp, Will Smith, Robert Downey Jr. and Jon Hamm have all been rumored to join the film at any point during its development. The film follows the love story of a talented young woman who falls for a falling star. There have already been three other versions of the movie, including the 1937 original film with Janet Gaynor and Fredric March, a 1954 version with Judy Garland and James Mason and a 1976 remake with Barbra Streisand and Kris Kristofferson. As musch as I like Beyonce and some of her music, she cannot act very well she is much too stiff and awkward in her delivery to my liking she needs to work with a acting coach to make her acting more believable, don’t know if Esperanza can act but good for her anyway. I think the verdict is still out on her acting. Her portrayal of Diana in “Dreamgirls” received mixed to bad reviews. But she did get better notices for her portrayal of Etta James in “Cadillac?”. she wa probably invited out, don’t like her or her music. maybe the rumors are true she’s having another fake pregnancy. hummm, only light skin will do? As for Beyonce passing on the role, it probably had something to do with Clint Eastwood’s recent pr troubles with the empty chair and all. I agree with TGen as well about the empty chair…and why is this movie being down for the umpteen time? I second that emotion! She probably didn’t want to have nothing to do with that old fool! I think remarking something one too many times is probably not a good thing. Casting an actress that can’t act probably not a good thing either. As much as I would like to say that the Eastwood thing had something to do with it, I don’t. Beyonce has never been one for an real social awareness and probably would pick a starring role over something that no one will be talking about after the election. I think a major issue with the project was finding a leading man. Plenty of celebs give birth and go back to work, Bey included. I think that if he wanted a strong lead, they probably wouldn’t want to act with someone who isn’t that great. There was some really good talent be throwing around with this project. Unfortunately, the star wasn’t one of them. 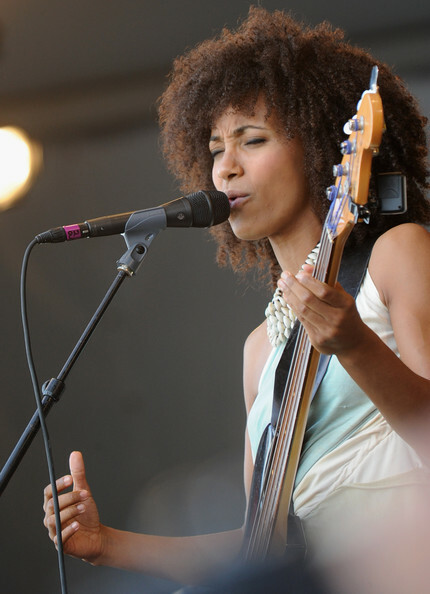 As for Esperanza, talent musician. Don’t know about the acting. But…we’ve seen enough of Beyonce to know that the person that gets the role can only be just as good or even a better actress. Why are the remaking this crap AT ALL. Glad Bey isn’t doing the movie but I always chuckle at the anti-beyonce brigade. Didn’t Kevin Costner do a movie w/a c-rated actress who never demonstrated any keen ability to actually act in ANY movie she starred? I have always liked Beyonce in onterviews she seems nice and sweet, I like her alot better than some of her music rivals and she is a good entertainer but her acting leaves a lot to be desired and that is the truth. And that c-rated actress ended up in a movie that grossed over $400k worldwide and produce the most successful soundtrack in history. And considering the state of the music industry, I’ll wager a bet that “The Bodyguard” remains the best selling soundtrack into perpetuity. Don’t underestimate her close relationship with President Obama. I was no Clint Eastwood prior to the rethuglican debate, but, once he tried to diss the President……..he can kiss my black….. Since I tend to go to matinees, he surely doesn’t need it, and nor will he get my $6! I am baffled why Esperanza Spaulding is in the running. But as a staunch supporter of President Obama, you diss him and try to make him look bad, and I’m done. “He’s All the President I Need” in the words of the beloved Whitney Houston.